I do quite a bit of work with The Newark Museum, serving on their Science Advisory Committee, and hosting seminars for teachers to help them bring the latest technology and science to life in their classrooms. It's a labor of love, for the museum means much more to me that just a place to have fun with science and technology. It's home. Growing up in Newark, many is the Saturday or cloudy summer vacation day I took the bus or subway downtown to spend the day in the museum. Like most young boys, I headed for the 3rd floor where the science stuff was kept and delighted in the exhibits and mechanical models on display. If I was lucky, the resident geologist was there; and if I could name correctly 3 rock fragments from the big glass rock case, I could take them home. I had a lovely little private rock collection at home to support my budding science interest. As I got older, I began to have an interest in the other floors of the building, visiting the art displays and taking in the artifacts of other cultures. It was a place that taught me how things are connected....... how history, science, art, and technology intermingle and give us this big panorama we call civilization and culture. Later, I learned how The Newark Museum was only one of a select few museums in the U.S. that housed both art and science under one roof, showing visitors the wonderful interlinking of these two aspects of human creativity and expression. A turn-of-the-century visionary named John Cotton Dana gave us this wonderful concept of a museum that was not just a stuffy and perhaps austere place to see some displays-as previous museums had been critically denounced- but rather a dynamic place where education for the general public is an essential part of museum life for visitors and their families. With The Newark Museum, Mr. Dana ignited a worldwide revolution in museum experiences that continues today. This jewel of a building was the epicenter for a tremendous change in the museum world, and today that leadership continues. 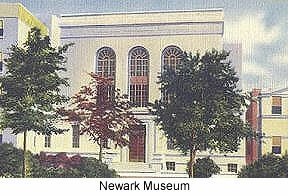 John Cotton Dana also gave us the spirit of The Newark Public Library, another of my favorite downtown places. At the Rutgers Newark campus their library building has been named in his honor, Dana Library. I recall fondly the cool interior of the museum on a hot summer day, and the big cavernous feeling I got upon entering the front door. Often, I would purchase a science book in the little gift shop, and read it on the way home. They are still in my home library, but now the pages are a bit yellowed with the years, a little like me....but the memories are yet green and fragrant....and renewed, whenever I walk through those doors. I hope I can do this for many years to come. If you have not been to the museum in a while, get there and enjoy the many wonderful things, and the new planetarium projection equipment. Next Fall (2002), a complete renovation of the 3rd floor will bring spectacular new natural science exhibits and educational opportunities. John Cotton Dana would be proud, and I am too, for having such a treasure so close to where I live and work.